Laguna Beach High School celebrated the opening of their new stadium building with a ribbon-cutting ceremony last week. The 2,322 square foot facility includes restrooms, lockers, coaches office and storage for their athletic programs. This year at the CSBA Trade Show, we asked participants to help us discover shared values for quality education in California by taking part in the creation of a data map. Through this visual language, they shared what they valued in delivering quality education to students. A groundbreaking ceremony was held this morning to celebrate the beginning of construction for Soboba Aquatics Center at San Jacinto High School. The community has been in desperate need for a pool since Sallee Park Recreational Pool, the only public pool in San Jacinto, closed in 2014. However, San Jacinto Unified School District (SJUSD) has been advocating for a pool long before the closure of Sallee Park. The District envisioned a high-tech facility on the high school’s campus fully equipped with features unique to their performing arts program. The new Performing Arts Center will serve as a beacon to the surrounding community by drawing patrons and supporters of the arts, and giving students the opportunity to collaborate and share ideas between various school programs and student cultures. The Innovation Center is equipped with immersive technologies and industry equipment in an effort to foster collaboration, inspire curiosity and to prepare students for their future. The vision for the re-energized Cajon High School performing arts theater modernization and expansion was to evoke a theater experience that rises to the level of talent in Cajon High School’s robust theater program and provide a space that is supportive of its future. The San Dieguito Union School District (SDUHSD) board has agreed to do a deeper dive into exploring the possibility of building a district pool or pools to support its high school aquatics programs. Cathedral City High School now has their very own swimming pool. After 26 years of bussing students to and from local aquatic centers, the CCHS Lions aquatic teams will have a place to compete and practice with pride. The ribbon cutting for the pool was held Tuesday, March 21 2017. Watch a video of the event on CBS. In January Indio High School had the honor of hosting a Student Screening Day for the Palm Springs International Film Festival. "When they got off the busses they were Aztecs and Blackhawks and Eagles and Knights and Rajahs. When they re-boarded they were 500 film lovers." We are ecstatic to see one of our favorite projects, Indio High School, open and ready to serve students. "The long journey to a new high school for students and parents in Indio is over. Congratulations to all who will enjoy the benefits of this dazzling new facility. Desert Sands Unified approved the renovation of the campus, which serves 2,000 students, eight years ago. The final work was completed recently and the new facilities went through their official public debut earlier this month." Ruhnau Ruhnau Clarke recently completed a unique design-build project at Palm Springs High School. This project presented a unique opportunity to preserve a historic building while bringing it into the 21st Century and capitalizing on the design-build experience of our team. The Palm Springs High School Auditorium has hosted superstars and high school students alike over its 60-year history. So when it came time to modernize it’s performance and seismic capabilities, keeping the historical nature of the building intact was a priority. The former interior of the Palm Springs High School Auditorium. Complete renovation of the interior with improved lighting and acoustics. The original red seat styling was replicated to preserve the historical connection. The updated lobby embraces the richness of the original materials while providing modern durability. 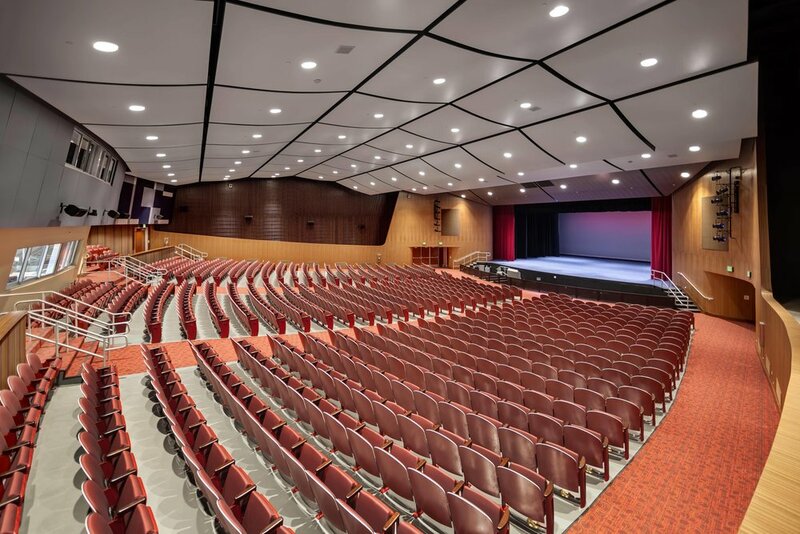 The new auditorium maintains the original modernist design while providing enhanced lighting and technology.